A precise and clear map carried out with advanced techniques and the collaboration of the geographical Service of the army. With isometric level lines by 100 m, it prints with precision the path of international alpinism E4 and the most popular paths. It prints with clearness and precision all the road network, all the villages and the cities. The picturesque ways are marked in green. Precise mileage from crossroads to crossroads and at some critical crossings is marked the spot (geographical coordinates) to know with certainty where you are if you travel with a GPS system. 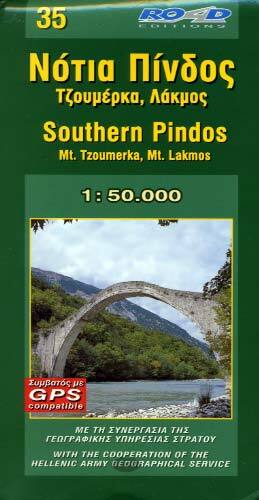 The map covers a great area (limited on the North by Metsovo ands the Sid-East by Argithea where starts the other map for Southern Pindos ("Agrafa" Road num. 37). The map is accompanied by a 48 pages insert in colors, with alphabetical index of all the villages, synoptic presentation and historical elements in Greek and English.